Something strange is happening at the Orsk furniture superstore in Columbus, Ohio. Every morning, employees arrive to find broken Kjërring bookshelves, shattered Glans water goblets, and smashed Liripip wardrobes. Sales are down, security cameras reveal nothing, and store managers are panicking. To unravel the mystery, three employees volunteer for a nine-hour dusk-till-dawn shift. In the dead of night, they'll patrol the empty showroom floor, investigate strange sights and sounds, and encounter horrors that defy the imagination. A traditional haunted house story in a thoroughly contemporary setting, Horrorstör is designed to retain its luster and natural appearance for a lifetime of use. 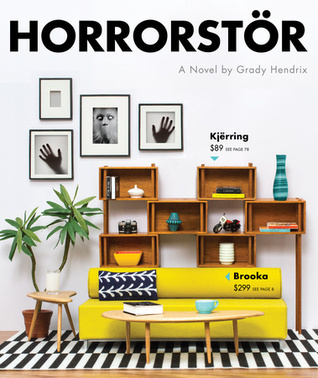 Pleasingly proportioned with generous French flaps and a softcover binding, Horrorstör delivers the psychological terror you need in the elegant package you deserve. I am not generally a fan of the horror genre, but I'll tell you what I am a fan of: subverting and satirizing genres I don't like. Horrorstör does just that. It is a traditional horror novel in plot, but the setting of a contemporary IKEA-esque furniture store along with the entire exposition that takes jabs at its corporate culture is anything but traditional. Another aspect of the story that subverts that traditional horror genre is, spoiler alert (highlight the white space if you want to read the spoiler): the black guy in the story doesn't die! What people will most likely notice in terms of Horrorstör's uniqueness and subverting of the horror genre is its packaging. Designed to look like a furniture store catalog, right down to the chapter titles named for pieces of Orsk furniture that sound very similar to the names of items you would find in an IKEA catalog, you can't help but notice Horrorstör on a bookstore or library bookshelf. Once the story got to the action of the horror tale, however, I wasn't so interested because as I said, I'm generally not a fan of the horror genre. But all that led up to the scary stuff was really fun and original and I applaud Grady Hendrix for his ingenuity. It takes something completely new and "never before seen" for me to sit up and take notice of a book from a genre I normally care nothing about. Horrorstör did that in spades.